Buste de femme de profil by Pablo Picasso. 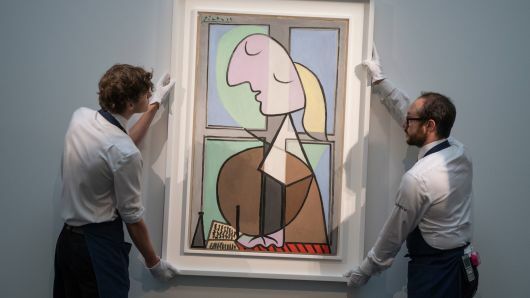 Photo courtesy of Sotheby’s. Sotheby’s stock (very clever symbol BID on the New York Stock Exchange) is down significantly to $46.99 (as of August 10, 2018) from a recent high of $59.67 on June 8, 2018. Analysts attribute part of the drop to a decline in margin resulting from the sale of two “Mystery” paintings. Art experts have identified the two paintings as a Modigliani sold in New York and a Picasso sold in London. Even though their selling prices were very high, their results hurt the bottom line. Following is the link to an article from cnbc.com that explains the seeming contradiction. The two mystery paintings that sunk Sotheby’s stock. 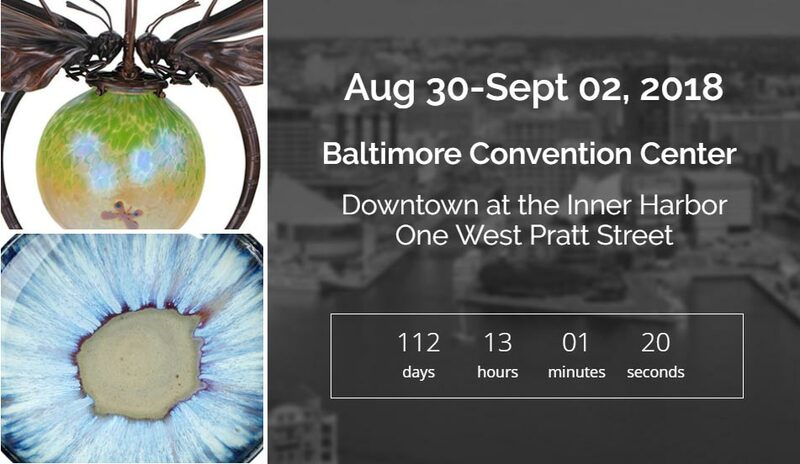 The Baltimore Art, Antique & Jewelry Show is now only two weeks away, at the end of this month, August 30 – September 2, 2018. Unfortunately the Baltimore show promoter has moved the show one week later than usual, to the Labor Day weekend. The show used to be held over the Labor Day weekend, but that was many years ago. The show is wonderful, so we’ll continue to exhibit there regardless of the change of dates. 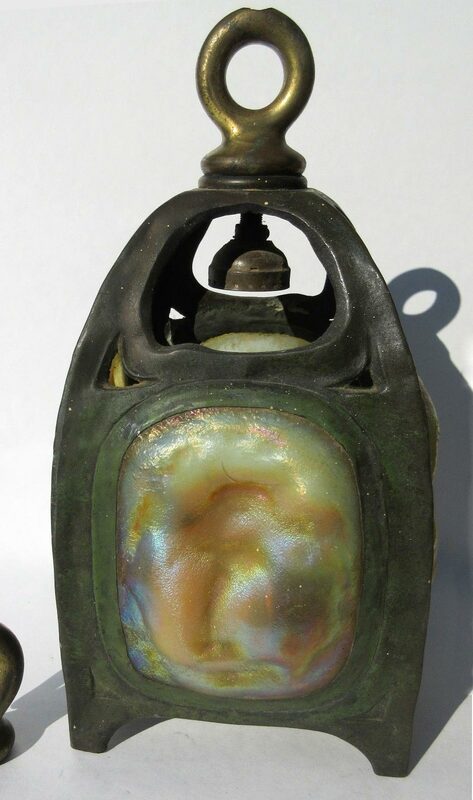 On May 9, 2018, a Tiffany Turtleback Tile lantern that started at 99¢ sold for $12,323 on eBay? What’s up with that? Let’s start from the beginning. 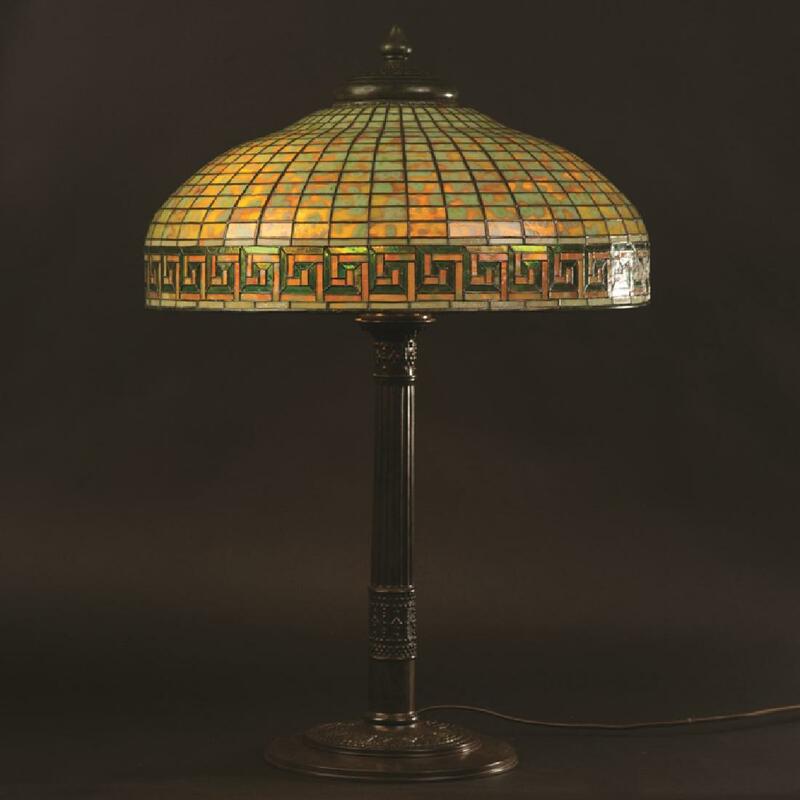 The title for the sale of item #302721920597, Rare Tiffany Studios Favrile Glass Turtleback Tile Arts & Crafts Lantern Lamp, was accurate. If you were knowledgeable, you would know that. But there are so many reproductions and bogus items for sale on eBay that if you weren’t an expert, you were taking your life into your own hands. I knew it was correct, so I bid up to $8,650 — not enough to win the item. It had a few problems. 1. It wasn’t signed (but lanterns like this are never signed). 2. The glass in the lower door panel was cracked. 3. The original socket was missing. 4. The chain and ceiling cap were missing. 5. The turtlebacks were gold (green are more desirable). These are all problems that a Tiffany dealer could solve, but not most individuals. A similar lantern was sold at auction in NYC at Sotheby’s on December 14, 2016, for $20,000, including buyer’s premium. That green example had no problems. All you need for a successful auction is two bidders. This item had 24 bids from several bidders. After my bid of $8,650, the bidding jumped in the final minute to $12,223 and then the final bid of $12,323. That’s a technique that smart eBay bidders use to avoid a reply bid. Time runs out and the auction is over. That’s contrary to the ethos of standard auctions which continue the bidding until the last man standing is the highest bidder. Some electronic auctions extend the bidding by a few minutes if there is bidding at the end, but not eBay. They are set in their ways. I suggested to them years ago to change their format, but they weren’t interested. I think there should be an option for sellers to allow extending the auction if there is bidding in the last five minutes. There is no downside for either eBay or the seller, only upside. Auctions should go to the highest bidder, not the one with the fastest trigger finger. 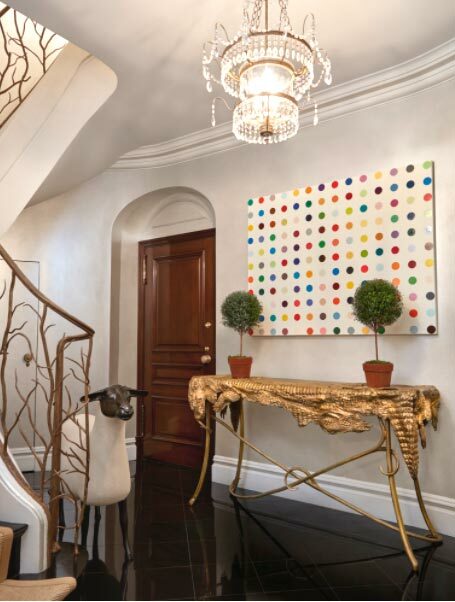 Sotheby’s New York, held a Luxe: Art of Design sale this past weekend with total sales of $4,991,877. The 584 lots were sold over two days, April 20 and 22, 2018 (which was unusual because most multi-part sales are held on consecutive days). 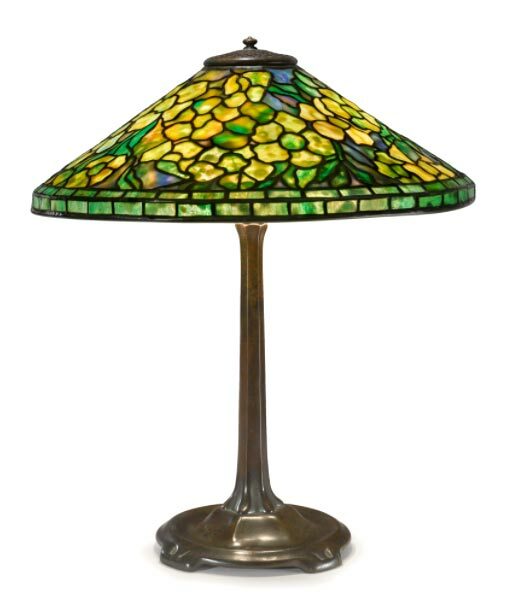 Included in the sale was a small selection of Tiffany lamps and glass — today’s topic. It’s a good thing I went to preview the auction in person. The two best lamps, that looked wonderful in the photos, didn’t look quite as wonderful in person. Both lot #1367, an Allamanda, and lot #1368, a Tulip, had extensive cracking and restoration. 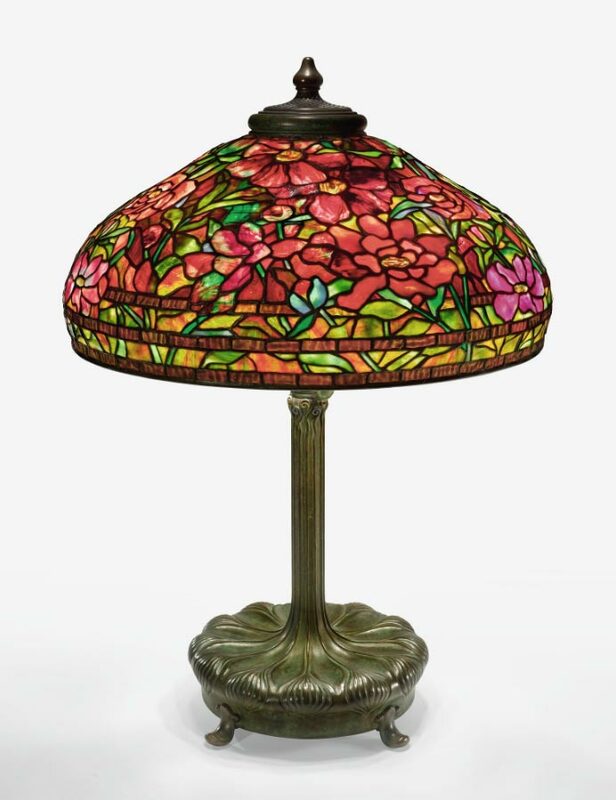 Regardless, lot #1368, the 16″ diameter Tulip lamp, sold well above its high estimate of $30,000, realizing $47,500, including buyer’s premium, for the highest price of the Tiffany selection. Lot #1367, an 18″ diameter Allamanda, sold near its high estimate of $35,000, realizing $42,500, including buyer’s premium — the second highest price of the Tiffany selection. That’s a pretty good price considering the lamp had damage, restoration and a simple base. If the buyer wants to upgrade to a library base, it will cost about $7,500 additional, if someone is willing to take the existing base in a trade. 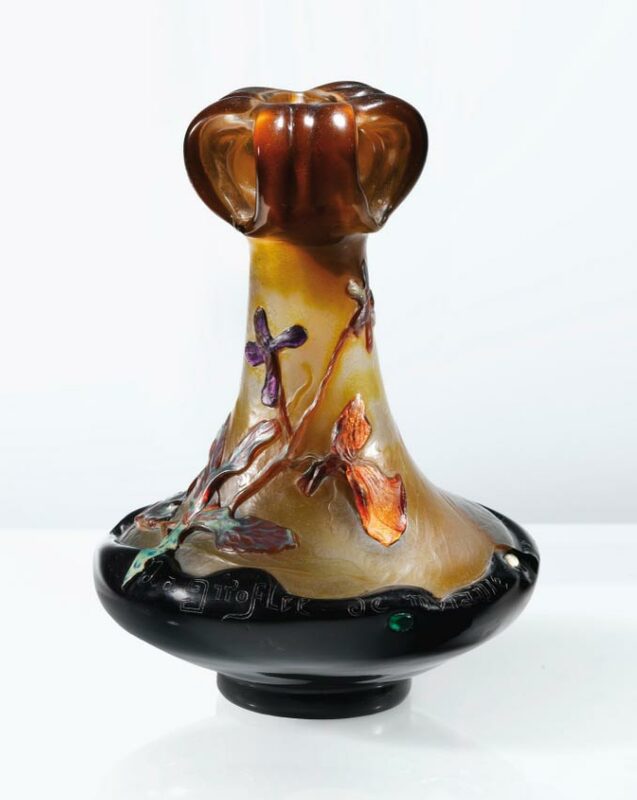 A decent 10-light lily lamp, lot #1372, sold above its high estimate of $20,000, realizing $27,500, including buyer’s premium. The shades were fairly well matched, but the gold doré base had some wear and corrosion. 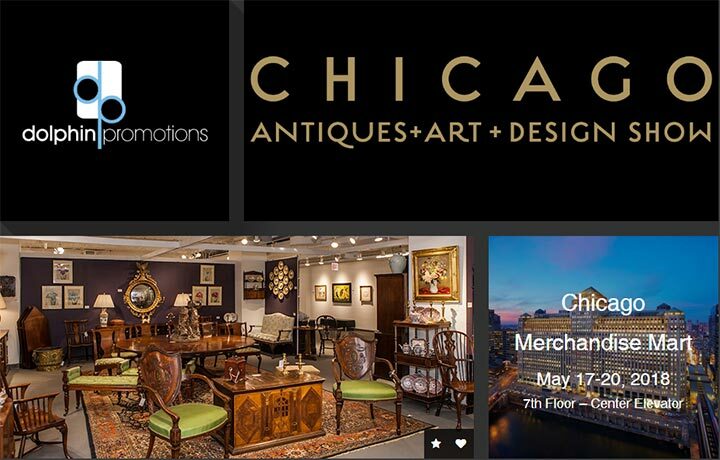 Our next show is now only three weeks away, May 18-20, 2018, when we’ll exhibit at the 2nd edition of the resurrected Chicago Antiques + Art + Design Show at the Chicago Merchandise Mart. It’s a wonderful venue for a show that deserved to be restored from purgatory. I was leafing through my catalogs when I noticed one from Sotheby’s Important Design sale on December 13, 2017. There were some great results that tie into the Arts & Crafts Conference we just finished last week. My post is a little late, but I hope you find it interesting and worth reading. Sales totaled $13,948,625 for the 165 lots offered. Three Crocodile lots, #s 52-54, by Claude Lalanne, topped the sale. However my interest is with the Arts & Crafts and the Art Deco lots in the sale. 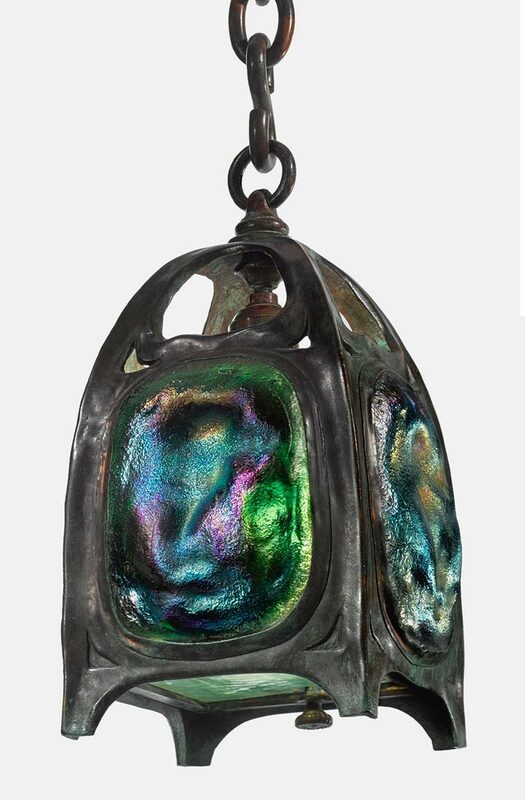 Lot #83 was a beautiful Greene & Greene lantern with iridescent glass from the Robert R. Blacker house in Pasadena, California. It sold near its low estimate of $250,000, realizing $287,500, including buyer’s premium. 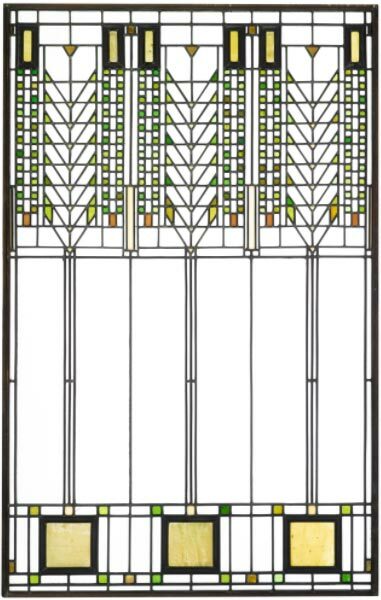 Seven lots of windows by Frank Lloyd Wright were included in the sale. Three lots, #s 88-90, all achieved the same result of $435,000 versus estimates of $200,000 – $300,000. 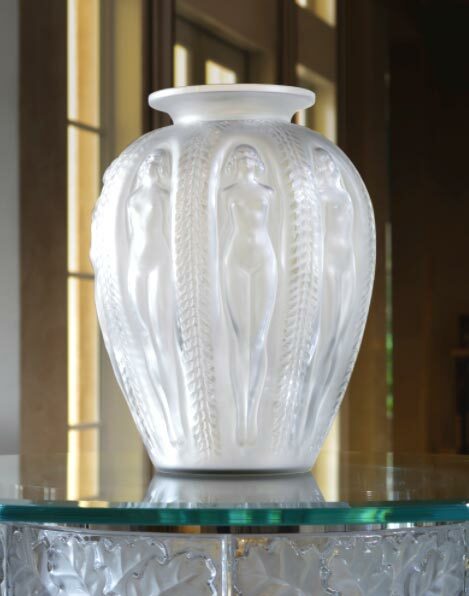 Two good pâte-de-verre vases by Argy-Rousseau, #s 105-106, failed to sell, with identical estimates of $30,000 – $50,000, while five lots of R. Lalique glass all sold mostly at or above their high estimates. 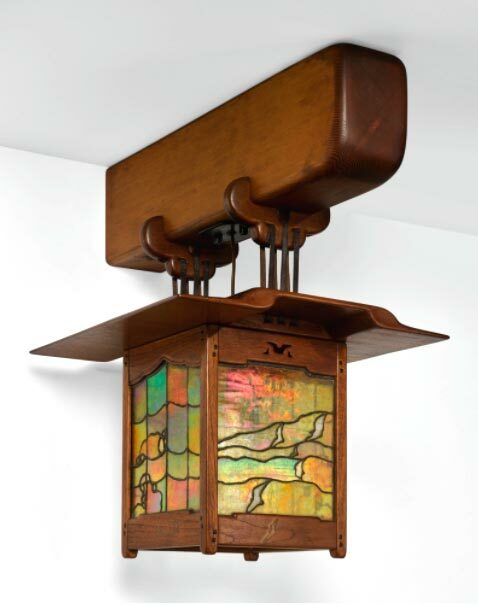 Sotheby’s New York, held two sales on the same day, December 13, 2017, devoted to the works of Tiffany Studios. 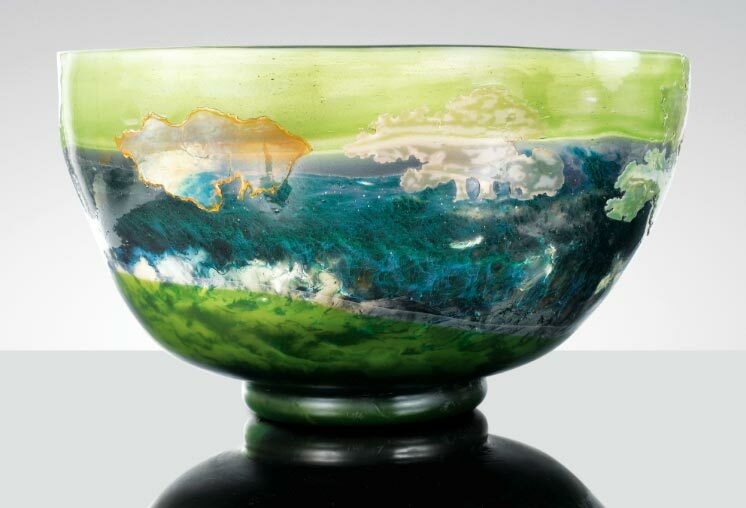 Today’s post will be concerned with the second of the two sales, Tiffany Dreaming in Glass. Sales totaled $5,111,250 for the 41 lots offered. 37 of the 41 lots sold, with many of them exceeding their high estimates. The results were strong, with two lamps selling just below or just above $1,000,000. This sale continued the recent strengthening of the Tiffany market (which I will write about in a separate blog). The top lot of the sale was #222, a rare, beautiful and important Cobweb and Apple Blossom table lamp with mosaic-tiled base. It sold near its high estimate of $1,000,000, realizing $1,155,000, including buyer’s premium. Results for the 13 lots of Tiffany Favrile glass were mixed. 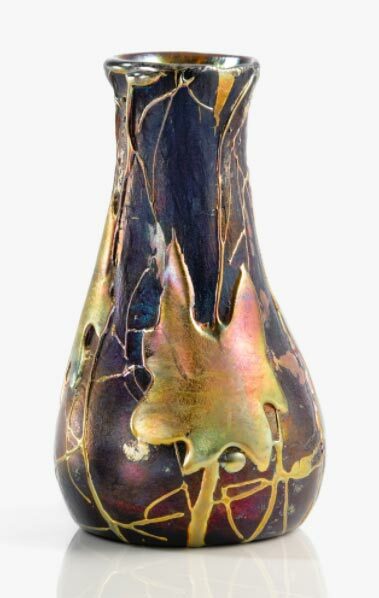 Lot #227, an important Lava vase sold for the highest price, $112,500, including buyer’s premium, but this was below it’s pre-sale estimate of $100,000 — $150,000. 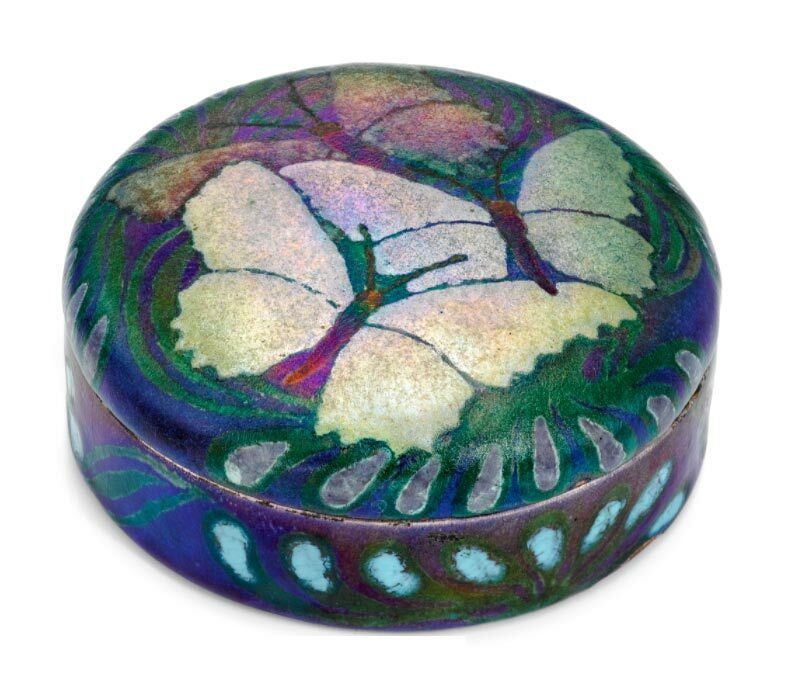 The first lot of the sale, #201, a rare enamel on copper Butterfly box, set the tone for the sale. It almost quadrupled its high estimate of $30,000, realizing $125,000, including buyer’s premium. 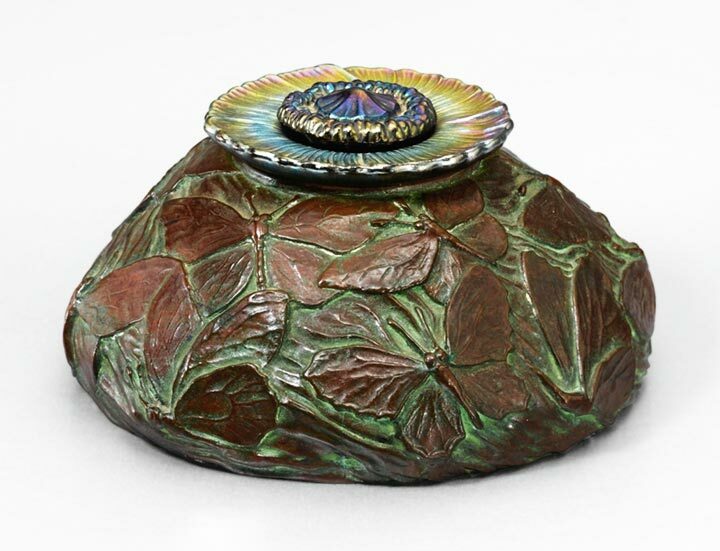 Rare Tiffany enamel on copper items have been on fire. Thursday’s post will be about the results of Julia’s glass and lamp sale, which also included strong results for Tiffany Studios’ items. You’ll want to read it. The Miami shows are only two and a half weeks away, with the first on February 2, 2018, when we’ll exhibit at the Miami Airport show. I’ve been beating the bushes finding new treasures and have come up with some beauties. I just listed over 18 new items on my website and will list more every week. Click Philip Chasen Antiques to take a look. My goal is to publish new posts twice a week — Mondays and Thursdays. However, readership slows down in the summer, so I will only publish on Mondays until the weather gets cold. 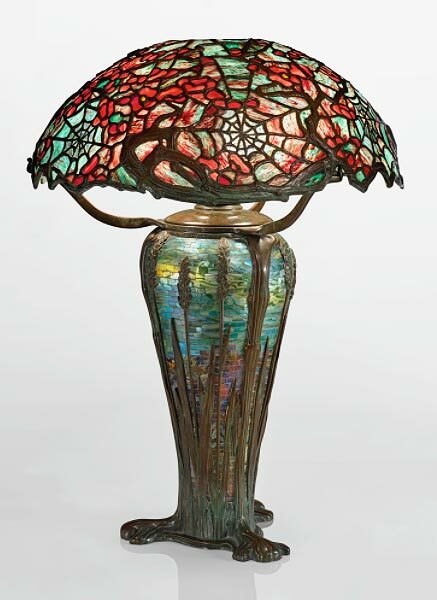 Sotheby’s New York held a special one-owner sale on June 6, 2017, The Estate of Carol Ferranti, Masterworks by Tiffany Studios. Sales totaled $2,388,500 for the 36 lots that sold, for an impressive average of $66,347. Only 2 lots failed to sell. A Butterfly lamp, lot #16, was the top lot of the sale. It sold within its pre-sale estimate of $400,000 – $600,000, realizing $648,500, including buyer’s premium. The exceptionally rare design included very unusual and attractive iridescent glass in the butterflies. Part of the fabulous collection included seven enamel on copper vases and boxes, all of which were rare, but some exceptionally rare. 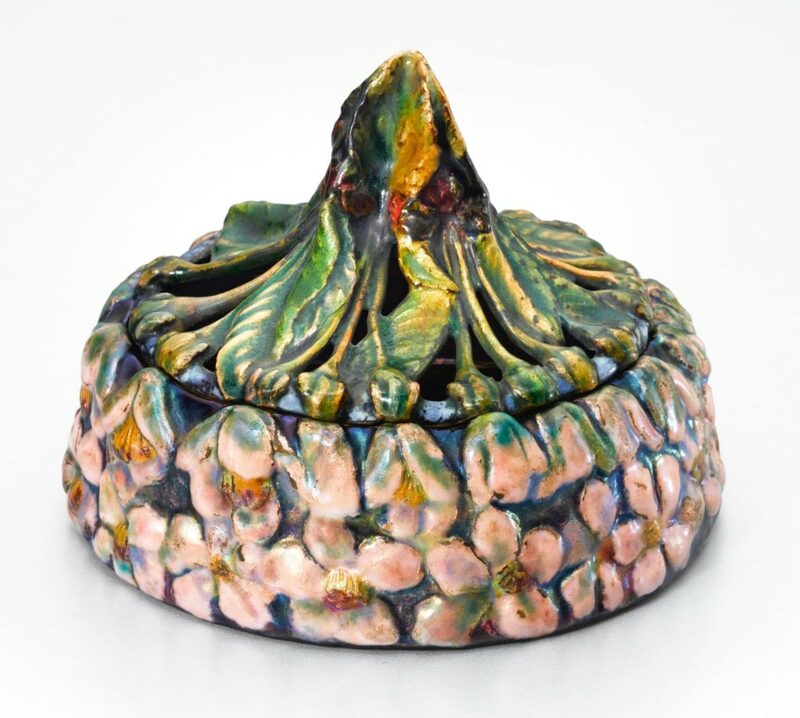 The top enamel lot of the sale was #13, a fabulous Apple Blossom box. It sold for $106,250, including buyer’s premium — well above its estimate of $50,000 — $70,000. A rare Butterfly inkwell, lot #29, did exceptionally well. It brought $80,000, including buyer’s premium, against a pre-sale estimate of $12,000 — $18,000. I suspect it did so well because of the result of the Butterfly lamp. If you had the money to buy the lamp, it was just chump change for the matching inkwell. Our next show is the Denver World Wide Antique Show in mid-July, so we’ll take some time to smell the roses. I’ll be buying and selling in the meantime, so be in touch if you’re doing either. I recently listed some new items on my website and I’ll be listing more in the near future. Please check my site as often as you can. 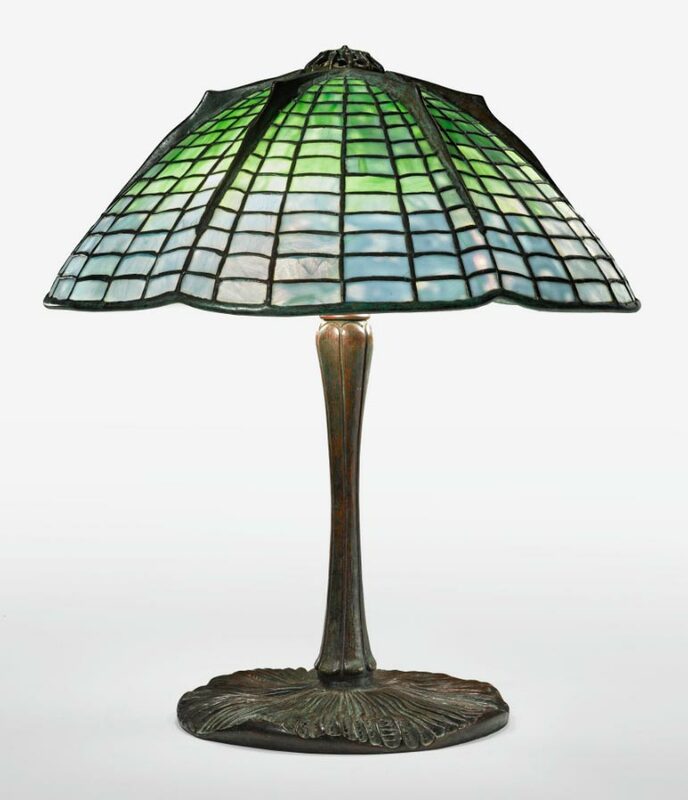 Two Tiffany Studios 22″ diameter Greek Key table lamps sold within one week, one at Cottone’s in upstate New York on March 25th and the other at Sotheby’s in New York City on March 29th. What a difference a day makes! Cottone sold lot #61 for $89,125, including buyer’s premium, against a pre-sale estimate of $25,000 – $35,000, while Sotheby’s sold lot #31 for $47,500, including buyer’s premium, against a pre-sale estimate of $20,000 — $30,000. So how do you explain that? 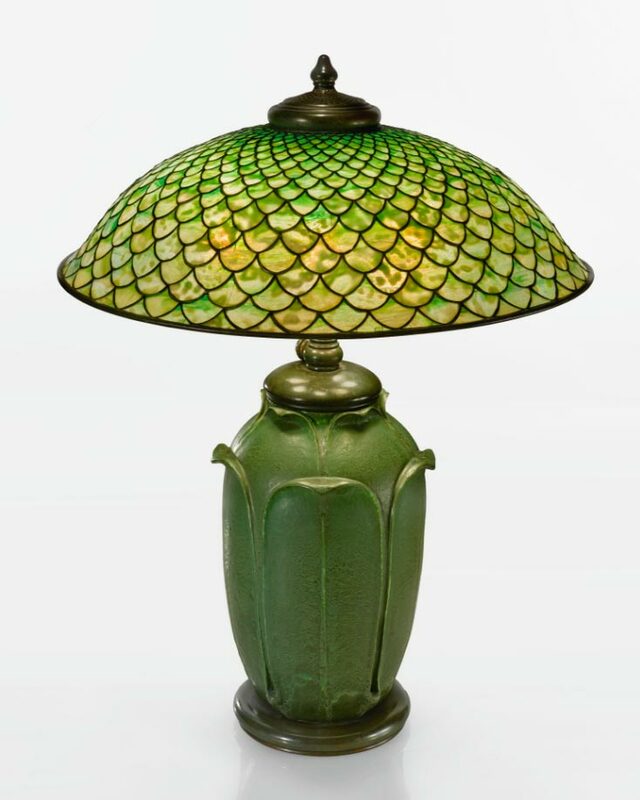 Cottone’s lamp had excellent orange mottled glass while Sotheby’s lamp had more common green striated glass with light mottling. Cottone’s was a table lamp, while Sotheby’s was a floor lamp, but Cottone’s sold for almost twice as much. I’m sure those factors played a role, but there’s more. Cottone’s lamp was a big fish in a small pond, while Sotheby’s was the opposite. That makes a difference. Two bidders with big egos and fat wallets duked it out at Cottone’s while the fighting at Sotheby’s was accompanied by a yawn. Every good auction result requires a bidder and an underbidder. Congrats to Cottone for corralling the right players. 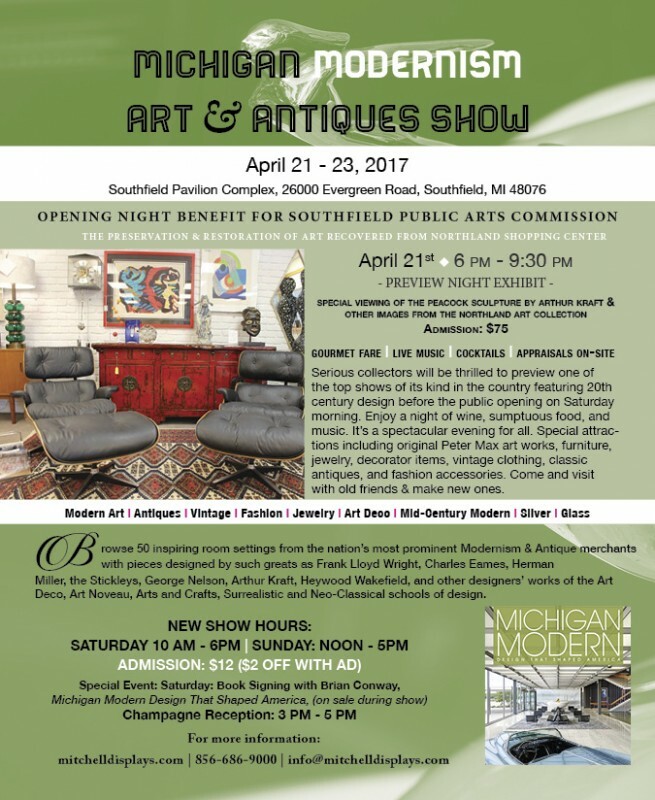 We haven’t exhibited in the greater Detroit area in over 10 years, but at the encouragement of a fellow dealer, we’ve decided to give it another shot. I enjoyed doing the show years ago and hope that business is good so we can add it to our regular schedule. The show opens with a preview party on Friday, April 21st and continues until Sunday, April 23rd at 5 PM. I recently listed over 15 new items on my website and I’ll be listing more in the near future. Please check my site as often as you can. Sotheby’s New York held their Design sale on March 29, 2017 with total sales of $2,742,251. 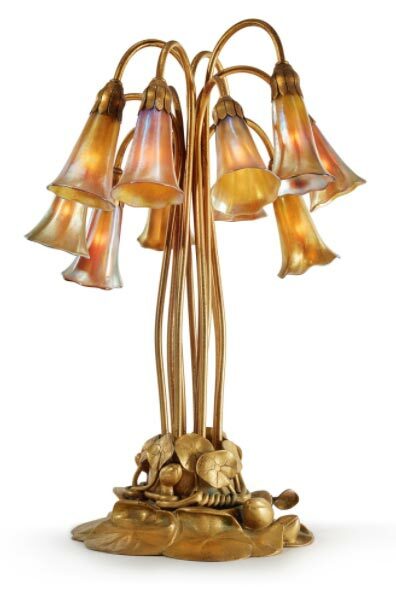 Included in the sale was a nice selection of Tiffany Studios lamps and French cameo glass. 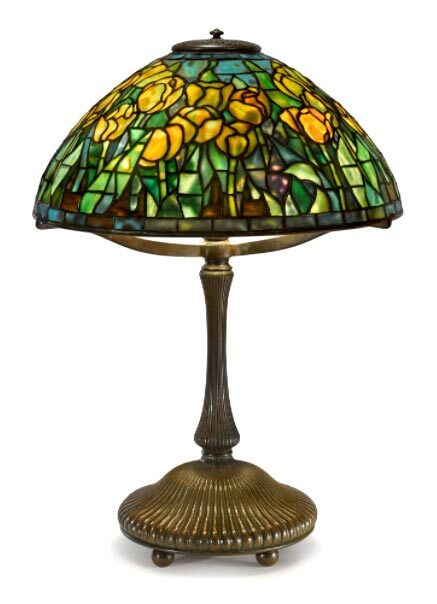 Lot # 16 was a beautiful Tiffany Studios 22″ diameter Peony table lamp, with impeccable provenance. It sold for its high estimate, $150,000, including buyer’s premium, but in my opinion, should have sold for more. I really liked lot #23, a lovely 16″ diameter Tiffany Studios Spider lamp. It sold for $35,000, including buyer’s premium, against a pre-sale estimate of $25,000 — $35,000 — an excellent price for the final buyer, but a bit too much for a dealer. I was the underbidder. 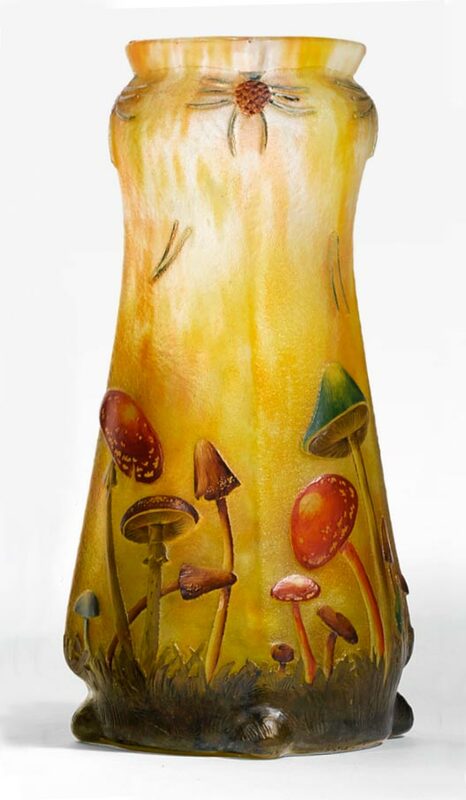 Top lot of the French cameo glass section of the sale was #98, a rare and very desirable Daum Nancy Mushroom vase, with wheel-carving and enameling. It more than doubled its high estimate of $9,000, realizing $21,250, including buyer’s premium. Sotheby’s Paris held their Emile Gallé sale on November 22, 2016, with total sales of €1,458,063 ($1,545,547) for the 51 lots offered, of which 9 lots failed to sell. Since the overall quality of the offerings was high, the average was a strong $36,798 for each of the 42 sold lots. A huge 17½” diameter, marquetry bowl entitled Coupe La Nature was the top lot of the sale. It sold close to its low estimate of €200,000, realizing €247,500 ($262,350), including buyer’s premium. The second highest lot of the sale, #135, also brought just below its low estimate of €200,000, realizing €235,500 ($249,630), including buyer’s premium. The vase was technically very sophisticated, with internal decoration and an inscribed poem, but not very pretty. I believe both items would have done better had they been offered with less aggressive estimates. 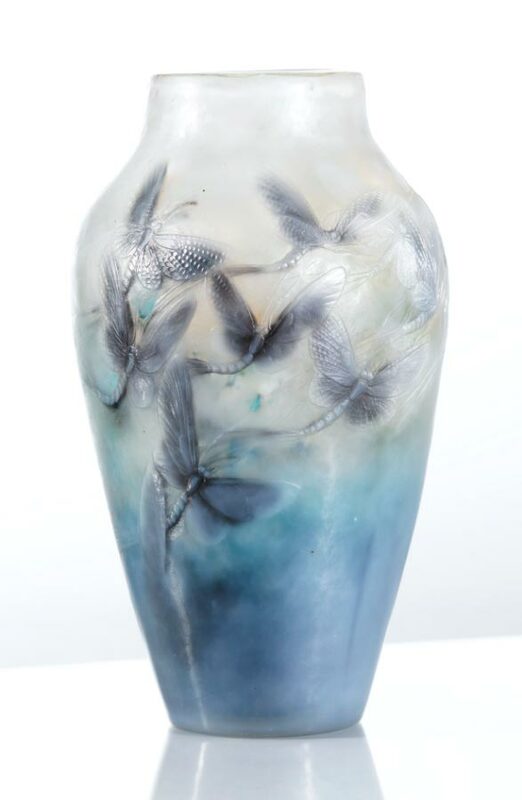 I loved lot #125, a gorgeous vase with wheel-carved and internally decorated butterflies, but it sold beyond my budget, realizing €60,000 ($63,600), including buyer’s premium, against a pre-sale estimate of €30,000 — €50,000. If I had my way, this vase would have sold for more and others would have for less, but once again I wasn’t consulted. What is wrong with those people? Our next show will be the NYC Big Flea, the weekend of January 21, at the Lexington Avenue Armory. After that we’ll be in Miami for the Miami Antiques + Art + Design Show, February 3 – 5, 2017. This is the airport show, which will be new and improved, with many additional exhibitors. The changes are happening because the Original Miami Beach Antiques Show will no longer be in Miami Beach, instead changing its name to The Original Miami Antique Show and moving to a new location in southwest Miami. It will all make for an interesting winter season. Sotheby’s New York held their Important Design sale on December 14, 2016, with total sales of $8,993,250 for the 168 lots offered. 40 lots failed to sell, for a strong average of $70,260 for each sold lot. 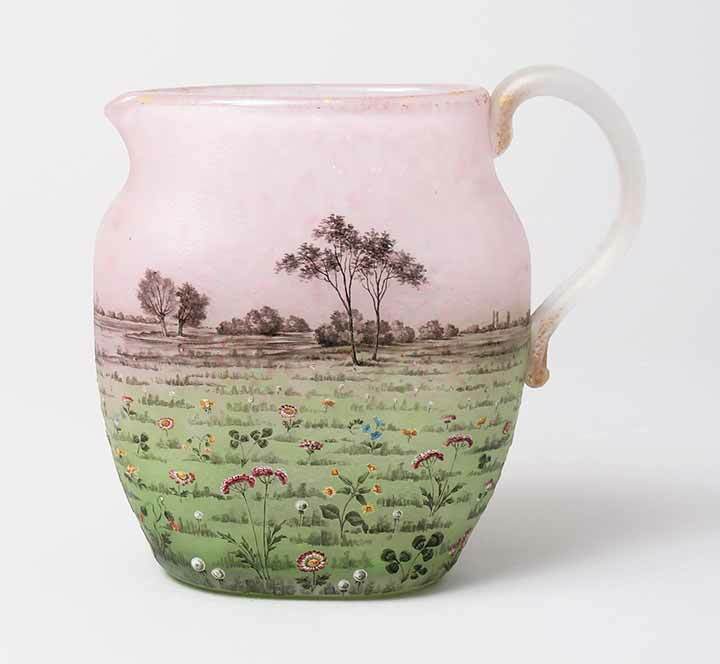 Included in the sale were 17 lots of important French glass, from a Midwest collection, by Emile Gallé, Daum Nancy, Burgun & Schverer and Argy-Rousseau. Also included were one Tiffany Studios lamp, two Loetz vases and an assortment of very high-end jewelry, furniture and assorted items. Two French glass vases tied for the highest price at the sale, $75,000, including buyer’s premium. 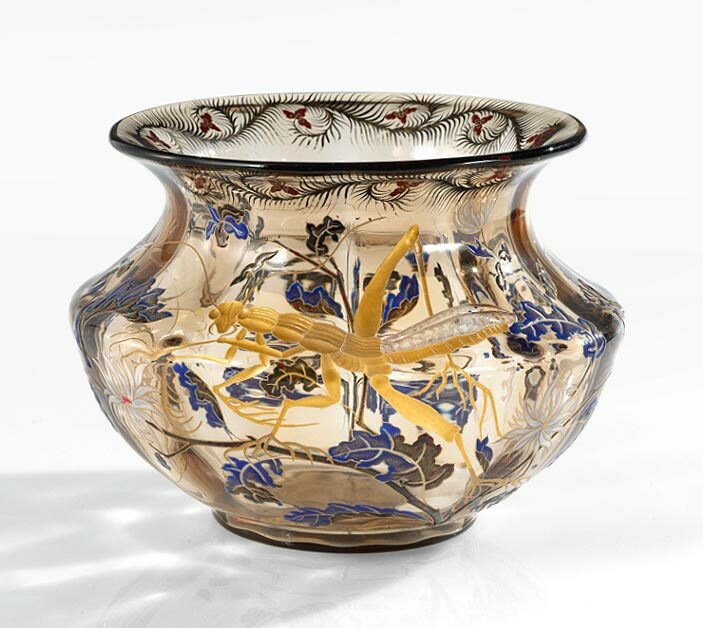 Lot #239 was an early Gallé Crystallerie vase from the 1880-1885 period, entitled Sauterelle et Chrysanthèmes (Grasshopper and Chrysanthemums). The techniques were wheel-carving and gilding for the grasshopper and enameling for the flowers and leaves. Its final price of $75,000 was triple its low estimate of $20,000. Lot #245 was a gorgeous Emile Gallé marquetry Crocus vase with a wonderful applied foot. 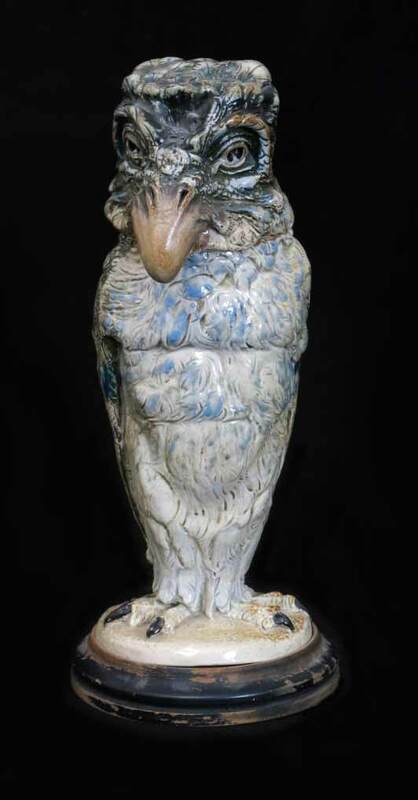 It realized the same price as the early Gallé vase above, but only doubled its low estimate of $30,000. 4 of the 17 lots of French glass failed to sell, for an impressive average of $30,866 for each of the 13 sold lots. 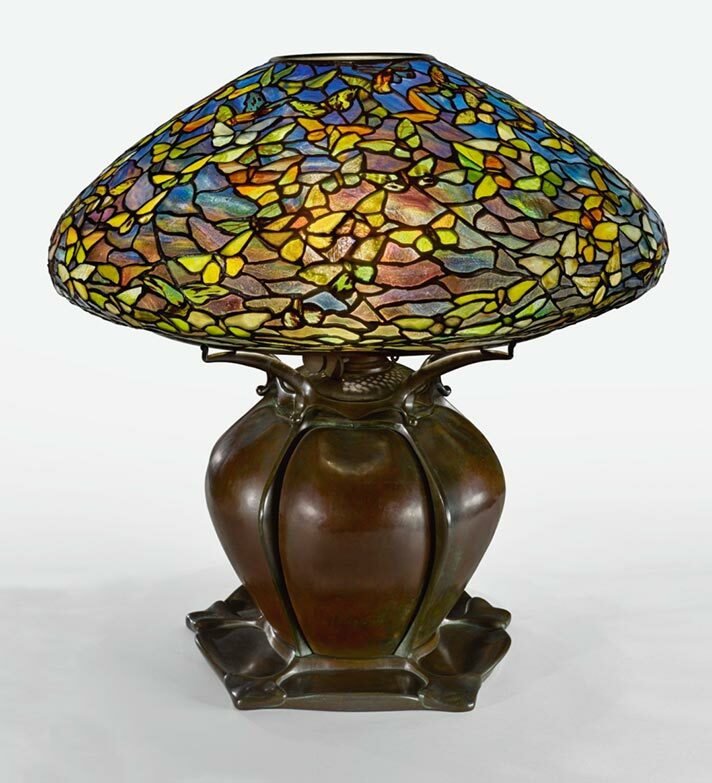 The only Tiffany Studios lamp in the sale, lot #215, was a Fishscale design on a Grueby pottery base. This rare lamp probably sold to an Arts & Crafts buyer. It realized $150,000, including buyer’s premium, equal to the low estimate of $120,000. I just bought this killer Martin Brother 11½-inch bird. I’ve been listing on my website many of the new items I’ve recently purchased and I’ll be listing more in the near future, including a couple of fabulous Martin Brothers birds and a great face jug. Please check my site as often as you can. No more shows in 2016. Our next show will be the NYC Big Flea, the weekend of January 21, at the Lexington Avenue Armory. After that we’ll be in Miami for the Miami Antiques + Art + Design Show, February 3 – 5, 2017. This is the airport show, which will be new and improved, with many additional exhibitors. The changes are happening because the Original Miami Beach Antiques Show will no longer be in Miami Beach, instead changing its name to The Original Miami Antique Show and moving to a new location in southwest Miami. It will all make for an interesting winter season.